Full-time undergraduate degree programmes are offered over a minimum period of three years. Both the private and public sectors regard public relations as a core strategic function as well as a management necessity in their aim to develop sound relationships between all stakeholders in a changing and unpredictable communication-orientated business environment. The Public Relations industry requires skilled individuals who are able to interface with all sectors of society, build stable relationships, and provide guidance on how to survive in the corporate world. Public Relations students gain insight into issues and trends that concern organisations. They learn how to embrace the various functions of the Public Relations practitioner, ranging from crisis management to relationship building. Students are exposed to current case studies enable them to place theoretical knowledge in context whilst learning how to research, investigate, and critique issues. Projects include the planning of effective campaigns and communication strategies, as well as the setting of communication goals. MGI’s Journalism laboratory allows them to benefit from computers with Internet access, daily and weekly newspaper features, magazine articles, and access to international news broadcasters by means of satellite television, including CNN and the BBC. Third-year students are required to join PRISA and to complete an internship at an appropriate company. Students acquire cultural insight and a comprehensive understanding of the corporate and media environment as well as government and current affairs. They gain the theoretical, verbal, and practical skills necessary to enter the industry as creative and innovative professionals who are able to recognise, examine, and resolve issues in a proactive manner and have a positive impact on a professional environment. Students are introduced to the basic principles of Public Relations. Computer literacy and various introductory business skills subjects are included. Students develop an intermediate level of knowledge and skills in the field of Public Relations. 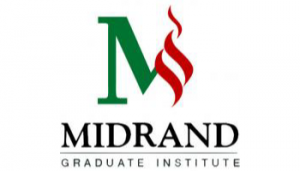 Students who successfully complete all levels of study are awarded the Midrand Graduate Institute Bachelor of Arts in Public Relations degree.